About Us - Corona, CA | Gallant Risk & Insurance Services, Inc.
Gallant Risk & Insurance Services, Inc. is a full service insurance brokerage. Gallant Risk & Insurance Services, Inc., offers comprehensive insurance services to customers throughout the state of California. Because our clients provide the infrastructure for our success, we aim to develop a proactive approach to protect their assets and discover cost-effective solutions that address their unique concerns. At Gallant, we have established a philosophy based on practical risk management and service to help our clients navigate the fluctuating insurance industry with ease. Customer fulfillment is of paramount importance to us, so we strive to cultivate lasting and synergistic relationships with all of our clients. We focus on customer-centricity in all of our decisions and actions. Our reputation is rooted in strong ethical standards. We pride ourselves on retaining long-term relationships with our customers. Our culture is defined as being fun and family oriented. We are known for being collaborative with all of our cpents and partners. Our team members are rewarded for the work they do. We prioritize talent development at all levels of our organization. Here at Gallant Risk & Insurance Services, Inc., we believe in building relationships with our neighbors and giving back to the entire community, so each year we work with a variety of local organizations to help make a difference. 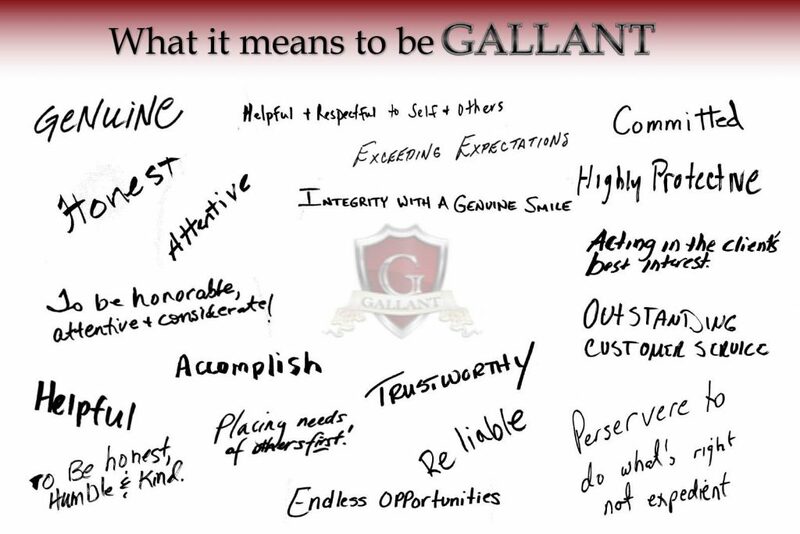 When you do business with Gallant, your investment is also providing help and hope to others.